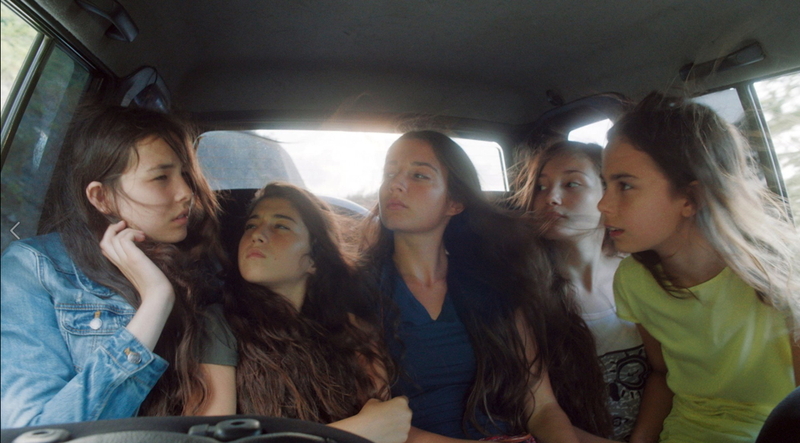 In a Turkish village on the Black Sea coast, five orphaned sisters celebrate finishing school for the summer by splashing in the sea with boys – only to be incarcerated by their grandmother and uncle who view their behaviour as unseemly and provocative. Instead of summer holidays they begin lessons at home in preparation for future marriage. Written by Deniz Gamze Ergüven and Alice Winocour and directed as a début feature by Ergüven, the film has been welcomed as a film by women about sisterhood and growing up under the restrictions of a conservative society. Deniz Gamze Ergüven is part Turkish and part French and the film is a co-production. Mustang is a stunning film and it’s no surprise that it has been celebrated by film festivals in Europe and North America and nominated for an Oscar in a very competitive competition. (But I’m intrigued about how it will fare in Asia.) In the UK the film is the second title selected for the BFI’s new distribution support scheme and it has been widely seen and discussed by enthusiastic audiences. Many of the reviews have made a reference to Sofia Coppola’s The Virgin Suicides (US 1999) – especially in the US. Certainly there are obvious similarities, but the film also uses ideas shared with other films in its universal story about families, conservative communities and girls’ adolescence in the face of the modernising impact of globalisation. One important difference to The Virgin Suicides is that it is narrated from the girls’ point of view. One sequence in particular reminds me of Jafar Panahi’s Offside (Iran 2006), with the struggles of young female supporters to watch men’s football in perhaps the most joyful sequence in the film. The depiction of rural weddings also makes me think of Mira Nair’s Monsoon Wedding (India 2001) as well as several weddings featured in Palestinian films. my five spirited and untamable heroines. Visually, even, their hair is like a mane and, in the village, they’re like a herd of mustangs coming through. And the story moves fast, galloping forward, and that energy is at the heart of the picture, just like the mustang that gave it its name. The film expresses things much more sensitively and powerfully than I ever could. I see it as a fairy tale with mythological motifs, such as the Minotaur, the labyrinth, the Lernaean Hydra – the girl’s five-headed body – and a ball that is signified here by the soccer match that the girls long to attend. Lale (Günes Sensoy) is the youngest of the sisters and the most ‘modern’? I thoroughly enjoyed the film and I was rooting for the girls all the way through, but even so I was surprised that I began to cry during the last scene which I did feel was a little too neat in its resolution – but clearly my emotional responses told me differently. Taking a more distanced view, I recognise the director’s argument (she also co-wrote the film with Alice Wincour) that the story uses symbolism rather than social realism. Even so, I think it might have been even more powerful if the five sisters had been represented a little more in social realist style. There are quite a lot of shots of the girls stretching in the sunlight streaming in through the windows of their room/prison with their graceful movements, beautiful legs and luxuriant hair. Are these shots designed for a ‘female gaze’? A debate about the aesthetic choices in the film would be good. I should note that the music in the film passed me by, but I understand that it is important. Whatever my reservations, this is a film that should be widely seen – it would be good if it developed the status of a La haine in its appeal to a youth audience and its questioning of assumptions. What’s happening in Turkey is both shocking and sad. The irony is that throughout the Arab world, in that strange way that ex-colonial ties work, it is Turkish film and TV which is bringing about the seeds of a social revolution in Muslim countries. There is an ongoing discussion about the film on ‘Conversations About Cinema‘. 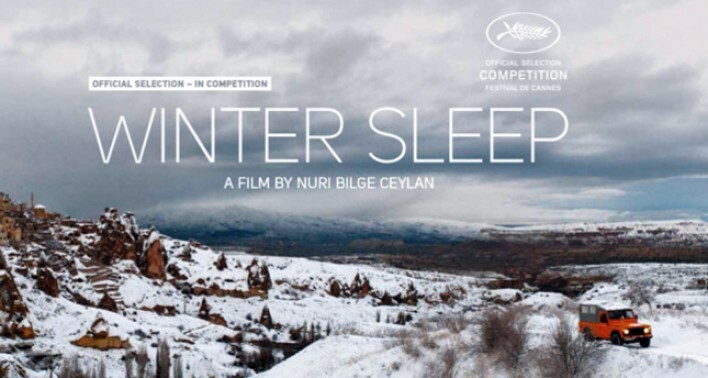 Winter Sleep (Kis Uykusa, Turkey-France-Germany 2014) – theatrical or cinematic? One of the characters in this film uses the word ‘awesome’ twice: it was my response after my first viewing of the film. The film is a worthy follow-on to Nuri Bilge Ceylan’s earlier masterpiece Once Upon a Time in Anatolia (Bir zamanlar Anadolu’da, 2011), though it is also rather different. This is rich and complex work of art. I feel that I need to think about it more and maybe view it again before I can write adequately about it. Understandably, then that it should feel theatrical;.. But for much of the time, the characters do little except talk at length, in darkened rooms. [which he describes as ‘long, stagey discussions’]. feel like transcribed chapters of a novel. Like fine theatre the film has great settings, excellent staging and seriously fine acting. But then much of cinema is, like theatre, a performance art. But it is a different art. In fact we talk not about staging but mise en scène. Among other things these sequences are beautifully lit. The rooms in which the characters talk are full of suggestive props and furnishings. But most importantly these images are presented via the camera lens. Several of these scenes commence with a long shot in long take. And long shots and long takes recur in the scenes but are intercut with close ups, large close-ups, changing camera angles, reverse camera angles, pans and tilts. The camera changes our perception of the characters’ interactions and with close-up shows that they are doing a lot more than just talk: with often delicate but often powerful gestures, body movements and expressions. In the scene between Aydin and Nihal [a husband and wife] that Romney picks out there is also a mirror shot, this brings a notable new perspective at this point. Likewise the sound is not live but recorded. The dialogue is clear and much of the soundtrack is natural sound. However segments of the film are set up by a solo piano. And the design in scenes of conversation uses noise, tone and timbre in a way that is rigorous and evocative. Ceylon’s films feature intelligent and stimulating use of image and sound, and this film offers just that. If you have not seen it yet, seek out a cinema with it in the programme. Don’t wait for the Blu-Ray or Television airing – this film deserves a theatrical setting. Both of my viewings were at the Hyde Park Picture House which enjoys a classical auditorium: this is the way to get the full pleasure of this film. The above film, directed by Nuri Bilge Ceylan may have presented difficulties for some viewers with its allusive and at times ambiguous narrative. My difficulty was rather different: this film won the Grand Prix at the 2011 Cannes Film Festival whilst Terence Malik’s The Tree of Life won the Palme D’Or (higher up the pecking order of the Festival Awards). This was a decision that I found difficult to understand. So I looked up the membership of the 2011 Jury on the Internet. It consisted of Robert De Niro (President), Olivier Assayas, Martina Gusman, Mahamat Saleh Haroun, Jude Law, Nansun Shi, Uma Thurman, Johnnie To, Linn Ullmann. I suppose I could imagine the President, Jude Law, Una Thurman and Johnnie To preferring the US epic. I was uncertain about Nansun Shi, Linn Ullmann and Oliver Assayas, but the last is attending the forthcoming Bradford Film Festival so I may get an opportunity to ask him. But, based on my viewing of their own film works, I did think that Martina Gusman and Mahamat Saleh Haroun would have recognised the outstanding quality of the Turkish film. Certainly when I saw it at my local independent cinema the staff remarked that many people had expressed admiration after seeing the film. After a pre-credit scene which turns out to be important in plot terms we see cars travelling along a country road by night. Such scenes appear in Ceylan’s earlier films, as do thunderstorms; here one threatens ominously through a large part of this film. The car sequence, which recurs several times in the film, is visually stunning. Ceylan and his cinematographer Gökhan Tiryaki are able to produce mesmerising images with their digital photography. And the sound, edited by Thomas Robert, is an equally impressive design. Ceylan has also expressed his liking for the Russian writer Anton Chekhov in interviews. Ceylan is also able to present characters and their inner thoughts as they struggle with the deeper meanings of the everyday: lives circumscribed by their character, circumstances and sometime the intractability of the world they inhabit. Whilst the film offers a very different story, set in a vastly different land and society, the parallels strike one: in my case with Chekhov’s masterpiece The Seagull. Gilbert Phelps’ comments on that writer, (The World Novel, 1988) seem quite apt: the “story ends in a struggle of dots, leaving it open-ended, with reverberations echoing beyond the limit” (of the cinema screen). In keeping with the influence of Chekhov, the key character in the central group of men in Once upon a Time in Anatolia (Bir zamanlar Anadolu’da) turns out to be the doctor. But in many ways, equally significant are the women. One is the daughter of the mayor of a village where a meal is taken. We never hear her speak, and only see her by candlelight. Another is the wife of a murdered man, again seen watching and passively waiting. The third we never see, she is only a character in tale recounted by one man to another. The fourth only appears in a couple of photographs. Yet I was keenly aware of how they affected the men, and how their enforced silence was itself a factor in the playing out of the story. Ceylan’s wife Ebru worked with him on the script for the film. I was left wondering if (as with many critics’ favourite auteurs) there is another untold angle on the world with which we are presented. There are telling small incidents – like an apple rolling into a stream – a policeman lighting up two cigarettes and offering one to his prisoner – a drop of blood splashing on the face of the doctor – which offer enormous resonance. The style re-inforces this – at one point we see the a close-up of the prisoner Kenan, later in the film identical framing and lighting is used on a close-up of the Prosecutor Nusret. This is a marvellous film: see it at the cinema, it will never be the same on DVD or even Blu-Ray. I expect it to be in my top five favourite films for 2012. If it is not, it will have been a wonderful year for World Cinema. The new film from Nuri Bilge Ceylan is due to open in the UK this Friday and last night we watched his 2002 film which I think was his breakthrough with arthouse audiences over here. I remember watching it without knowing anything about the director and being very impressed back in 2004 when it finally reached London after winning prizes at Cannes in 2003. 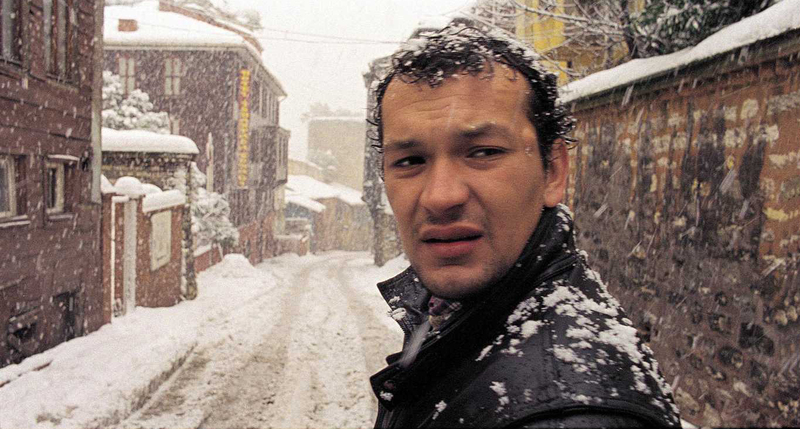 My strongest memories of the film were the compositions of one of the two principal characters, Yusuf (Emin Toprak) isolated in the snowy urban landscapes of Istanbul. This was the third film by Ceylan (co-writer and director) to feature Toprak with Muzaffer Özdemir. Soon after completing the film Toprak was killed in a car crash, a tragedy that would also ultimately change the director’s approach to casting. In Uzak, Özdemir plays Mahmut, a village boy who has built up a successful career in Istanbul as a photographer. Yusuf is his country cousin who is forced out of his village by redundancy and comes to Istanbul seeking work on a ship. Mahmut is a rather reluctant host, a divorced man stuck in his ways who thinks of his cousin as something of a country bumpkin. The film’s title refers to the ‘distance’ in culture between the village and the big city – and the potential distance between the two cousins. The film is strong on metaphors and symbols. Istanbul looks wonderful cloaked in thick snow and Ceylan knows just how to make use of the possibilities it offers as Yusuf wanders forlornly around the waterfront looking for work. At the end of one hopeless trip he stares down at a bowl of small fishes one of which has fallen from the bowl and is thrashing about in a puddle – we know how he feels. Back in Mahmut’s flat the two men do battle with a mouse in the kitchen with sometimes hilarious outcomes but the inference is clear. The country mouse has come to town and the town mouse doesn’t know quite how to react. In his use of two non-professionals as leads, Ceylan is using men he knows (he often used other members of his family in his early films) and he has admitted that the early films are autobiographical to some extent (for instance, Muzaffer appears as both a filmmaker in Clouds of May (1999) and a photographer here, mirroring Ceylan’s activities. I’m not sure whether Mahmut’s rather wonderful flat is actually Ceylan’s but we do see a poster for Ceylan’s first film, a short titled Koza on Mahmut’s wall. If Mahmut is in any way ‘representative’ of the director, it is a brave self-examination because Mahmut is certainly a man with flaws. He has become the isolated and alienated intellectual who has even lost interest in the art form that drove him in his career. The film sets up a nice contrast between Yusuf’s traditional community-orientated values and Mahmut’s disdain for family and friends. But it also hints at the possibility that Yusuf could end up like Mahmut if he spends too much time in the city. In this sense the scenes in which both men (separately) stare out across the Bosphorus from the waterfront remind us of the key geographical and cultural location of Turkey, looking out to Europe and beyond and back into the hinterland of Western Asia. The film is slow-paced but never dull. I never felt it dragged and that is down to Ceylan’s fine visual sense (he photographed the film himself), enough humour to spice up the observation of the characters and two fine central performances that won the pair a joint acting prize at Cannes. This is a Turkish film restored by the World Cinema Foundation and screened at Il Cinema Ritrovato this year. It was recommended for restoration by Fatih Akin (the young Turkish-German filmmaker), who introduced the screening along with one of the surviving cast members. The film is considered important because it featured a key director of the 1960s, Orner Lüfti Akad, and as writer and star, the now well known filmmaker Yilmaz Güney. 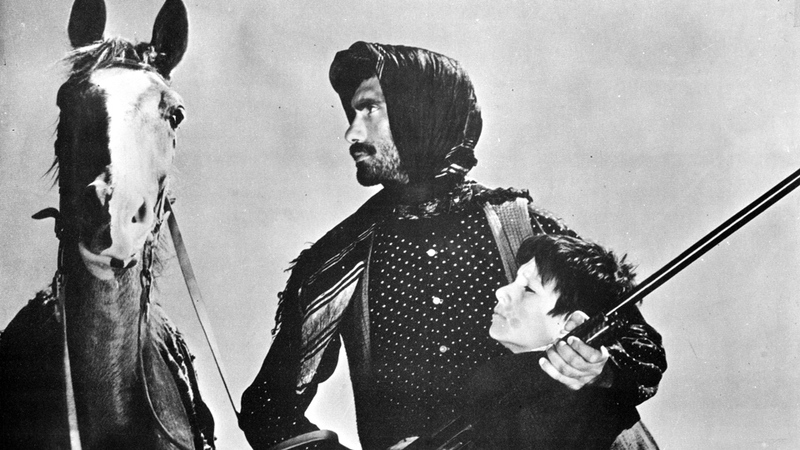 Akin writes on the film: “Turkish cinema in the Sixties took place in a dream world. The movies of that era refused to look directly at Turkish society. . . . This was the beginning of what would later be called ‘New Cinema’ in Turkey, with its powerful cinematography and its direct and realistic depiction of social problems”. The film is set in the Southeast border region of Turkey. The area is policed and controlled by the army. However, the poverty and lack of resources drive people to the ‘law of the border’, smuggling. The attempts to prevent such activities are draconian, including minefields along the border. The key characters in the film are Hidir, (played by Güney) an expert in defeating the methods restricting border crossings. Standing against him is the new army lieutenant (his predecessor was shot), Zeki. However, the real conflict and violence is between Hidir and a rival smuggler Ali Cello. Their competition is aggravated by the actions of a local rich landowner, Dervis Aga. The conflict is also complicated by Hidir’s young son, Yusuf, and by a local teacher, Miss Ayse. Zeki is an enlightened officer, and he co-operates with Ayse to open a school in Hidir’s village, Deliviran. Because of his fears for his son’s future Hidir is torn between his success as a smuggler and the alternatives. One of these is a sharecropping scheme, facilitated by Zeki. However, it depends on the landowner Dervis Aga, who is more interested in profits than in social action. His plotting with Ali Cello sets up a violent and finally tragic ending. Güney’s Hidir is a powerful centre to the film. He was to become the most popular star in Turkish cinema. Zeki is a liberal officer who also represents progress. This applies equally to Miss Ayse, who is a modern woman wearing western clothing and even smoking on one occasion. This sets both Zeki and Ayse off from the milieu of Hidir, traditional and religious. In introducing the film Akin had to explain the poor quality of the surviving materials used in the restoration. Apparently only one print survived a coup d’état in 1980: all other sources being seized and destroyed. The Foundation notes explain how they used these sparse sources to create a print, which is still marked by this wear and tear. It notes “some frames were missing”, but apparently this new version is more or less complete. Akin also remarked that the final film was a ‘compromise’ between filmmakers and the army. The character of Zeki was presumably important in this respect. At the same time the sympathetic portrayal of what the establishment would regard as criminal and subversive presumably explains why the film was savaged later. It took me a little time to identify the key characters and their different situations. However, once I had done this the narrative is relatively straightforward: the style less so. The film is clearly influenced by neo-realism: possibly also by spaghetti westerns, and it plays in many ways like a western, with a strong revenge motif. But is also uses unconventional techniques of other new waves, in particular the jump cut. One sequence of a shoot-out reminded me irresistibly of the work of Glauber Rocha. There is extensive use of jump cuts, especially as the drama increases. The editing generally is often unconventional. I did wonder if there were missing sequences but it appears to be more or less complete. My wonder sprang from a series of shots inserted between scenes, which merely show characters and setting, then continue elsewhere. I assume these are intended as emblematic shots and form part of the visual commentary of the film. By the film’s end, having got to grips with the characters and their conflicts, I found that it developed a really powerful feeling. And whilst downbeat, it is not entirely despairing, there is the possibility of a future. That is ironic as the border areas continue to be a severe problem for Turkish society and the Turkish State. A film reviewed at the Leeds Festival, Kosmos (2010), was set in the Bulgarian/Turkish border area, and once again there were border problems and the ever present military. The film is worth seeing both for its quality and power, and also because so little of Turkish cinema is available in the west. It seems that in this period Turkish cinema was producing up to 300 films a year. Yet nearly all are little known, and there is little available English writing on Turkish film. Some of the later films that Güney directed are available, like Yol (1982). But largely it is another ‘unknown’ cinema. Unfortunately the World Cinema Foundation films tend to turn up at festivals rather than getting a wider distribution. And they do not appear to have a policy, or perhaps the resources, for DVD releases. But it is worth keeping an eye open for an opportunity to see this film. Turkey 1966. Director: Lüfti Akad. Scenario, dialogue: Orner Lufti Akad, Yilmaz Güney. From the novel by Yilmaz Güney. Ph: Ali Uğur. Music: Nida Tüfekçi. Yildiz film studios. 35mm, black and white, 74 minutes. Cast: Hidir – Yilmaz Güney. Ayse, teacher – Pervin Par. Yusuf, Hidir’s son – Hikmet Olgun. Ali Cello – Erol Tas. Bekir – Tuncel Kurtiz. Dervis Aga – Osman Alyanak. Abuzer – Aydemir Akbas. Zeki, First Lieutenant – Atilla Ergün. Restored by the World Cinema Foundation at L’Immagine Ritrovata Laboratory. Turkish version with French subtitles: English translation provided for screening. Honey is something of a companion piece to Le quattro volte as another example of ‘slow cinema’ (and as a prizewinner, the 2010 Golden Bear at Berlin). It’s the final film of a trilogy but since I haven’t seen the other two I’ll discuss it as a one-off. The title refers to the occupation of the protagonist’s father. 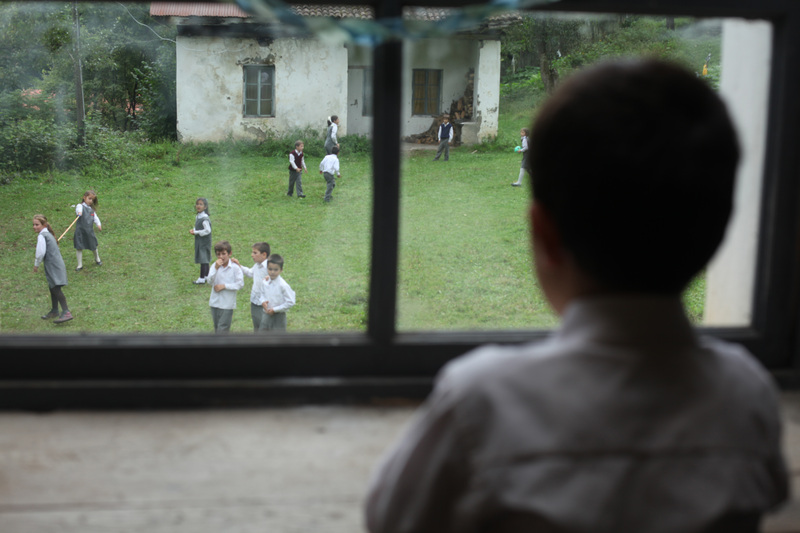 7-year-old Yusuf lives in the mountains of Rize Province near the Black Sea Coast in the far North-East of Turkey. His father Yakup places hives in the tallest trees and the sale of the honey is the family’s chief income. Yusuf is devoted to his father and every day he rushes home from school to see if Yakup has made any progress in carving a small wooden sailing ship. At school Yusuf desperately wants to get the medal that his teacher bestows on any student who successfully reads out loud, but Yusuf is too self-conscious to manage this and can only stutter – much to the amusement of his classmates. At home, he reads the almanac for his father each morning, safe and confident in his home surroundings. Father and son have a close bond and Yusuf whispers to his father about their secrets as they walk through the forest to check the hives. The film shares the narrative structure of the Japanese film Seesaw featured earlier in the festival. It opens with an incident that leaves us literally hanging and to which it returns later in the film. The local bee hives are failing and Yakup is forced to look for suitable sites in a forest some distance away. When he doesn’t return after a few days Yusuf’s mother Zehra begins to worry. She takes Yusuf to stay with his grandmother and also to a big local festival where she seeks news of Yakup. These are the only scenes outside the home, school and local forest tracks. The cinematography is beautifully composed, scenes are well lit, the performances are extraordinary, especially that of Bora Altas as Yusuf. Writer-director Semih Kaplanoglu writes about how he managed to get Bora to act the part of Yusuf – a boy with a very different personality (see the Press Pack from Olive Films). Kaplanoglu describes his approach to filmmaking as ‘spiritual realism’. This is something he has discovered through making the ‘Yusuf trilogy’. He seems to invest a great deal in every decision he makes about locations, actors and technology/techniques. I’ve discovered that the trilogy has actually been made in reverse chronological order so that Honey finally reveals some of the events that helped to make the adult Yusuf in Milk (2008) and Egg (2007). Neither of these films seems to have reached the UK, but I’m intrigued to see them now. Kaplanoglu is not interested in period drama as such so all three films (which cover 30 years or so and have different actors playing Yusuf) are set in the present. Even so, Kaplanoglu tells us that the forest setting in Honey is magical and traditional in an area of outstanding beauty that is disappearing under the pressure of development. In 2.35:1 colour, with English subtitles. 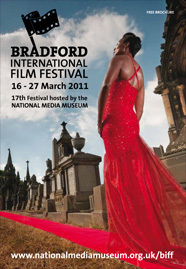 Screened at the Leeds International Film Festival, 2010. This is another fine Turkish film. After years of being practically invisible, the last decade has seen Turkish cinema producing a series of beautifully crafted and fascinating features. Notable among these have been the films of Nuri Bilge Ceylan. The terrain in this film reminded me of the winter sequence in Ceylan’s Climates (2007), though that was set in Eastern Turkey and this film is set in the North West border territories. It is from that border wilderness that the central protagonist of the film emerges. This is a great opening shot as a small figure gradually emerges from the wintry wasteland. He is called Kosmos He arrives at a border town. Whilst washing in the river he spies and saves a drowning boy. The boys sister Neptün believes Kosmos has bought the boy back from death. As this news spreads in the close-knit town community Kosmos is made welcome. Attempts are made to provide him with accommodation and work. But Kosmos is a wayward spirit. He is taciturn, and his occasional utterances sound like quotations from sacred volumes, most likely the Koran. Moreover, as he tells the townsmen, he is looking for love. He finds this with Neptün, a kindred spirit. They often communicate by shrill, laughing cries. Kosmos’ search for love crosses the cultural taboos about sexuality. And his attempts at other good deeds, including procuring medicine for a desperate and lame young woman, capture the attention of the army: the actual law enforcing agency in the town. By the film’s end Kosmos is sought by both hopeful townspeople seeking miracles, and by an army officer and his squad. The film ends as he disappears back into the wintry wilderness. However, Neptun’s own screeching at the captain suggest the possibility that she now also possesses Kosmos’ unusual powers. The film treads an uneasy but successful line between drama and farce. The recurring cries of greeting between Kosmos and Neptün are bizarre by conventional film standards. But the film manages to evoke both a magical world and the staid everyday world into which it collides. This is partly done by effective characterisation and a remarkable mise en scène. The film makes fine use of the widescreen imagery, and snow, mist and shadows contribute powerfully to this. An atmospheric soundtrack accompanies the visuals. One set of the recurring sounds on this are distant or not-so-distant explosion, as the army conduct manouvres near the border. There are also suitably bizarre episodes to match the wayward world of Kosmos. So a Russian space capsule crashes nearby one night and provides a notable distraction in town life. The film also manages to retain some ambiguity about Kosmos’ powers. His ‘miracles’ are not uniformly beneficial. There is a young boy who has been dumb for a year after a traumatic experience. Kosmos restores his powers of speech, but the boy is then struck down by a fatal illness. This adds to the antagonisms that develop towards Kosmos. The background to the story and main characters are sketched in with detail and frequent eccentricity. One recurring scene shows a band of four feuding brothers, driving round with their fathers coprse and coffin whilst they struggle over his inheritance. Some of the recurring motifs are clearly symbolic, and a little over emphasised. Thus there are frequent shots of cows being led to an abattoir: and also a flock of geese waddling down a street. But most of the motifs add to the atmosphere of the film and story: the recurring thefts from the shops: the café where only men drink their tea and talk: the scenes by the river, a fast-flowing icy torrent; a mist-laden square dominated by a statue, presumably Ataturk: all help to build up the enclosed world of the town. Definitely a film to be seen and enjoyed: though it may take a little time to adjust to the film’s oddball flavour. The global soap opera is a phenomenon that should get much more attention in both film and media studies. TV soaps are primarily the television offspring of traditional cinematic family melodramas, albeit in ‘serial narrative’ form rather than single narratives. Their production flourishes in those countries with a heritage of film production in this genre. The US and UK, other English-speaking countries (e.g. Australia) and much of Europe have produced soaps for home consumption and exports within their own language markets. The same is true in India (and probably East Asia – can anyone confirm this?). But the interesting development is what global media theorists refer to as the ‘contra-flow’ of exported soap operas outside the American-dominated English-language market. 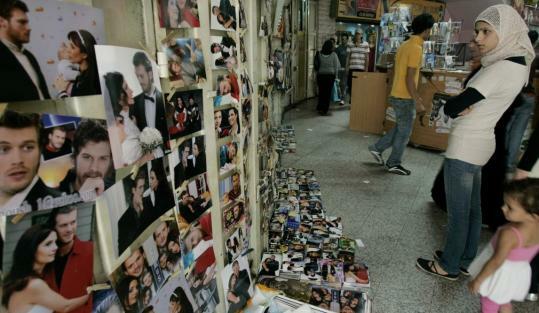 The Latin-American telenovela in Spanish or Portuguese conquered much of Africa and parts of Eastern Europe decades ago, but it has competition from another source – the Arabic-language soaps primarily from Egypt, but according to a recent news report also in dubbed form from Turkey. Noor is a Turkish soap which when it finished its run was attracting up to 80 million viewers from “Morocco to Palestine” according to the Guardian and which is now promoting tourism from Arab countries to Istanbul. This looks like an effective move into ‘soft power’ as Turkey seeks leadership across the countries of North Africa and Western Asia. It goes well with the recent resurgence of Turkish Cinema. Researching this story, I’m all too well aware of my ignorance of a programme that has become a cultural phenomenon in the Arab world through showings first on the MBC channel.